Fans of Robin Hood, Rob Roy, The Three Musketeers, Zorro, the Scarlet Pimpernel and Dr. Syn are sure to flock to this Errol Flynn style swashbuckling throwback to the golden age of escapist tinsletown fare of 1940s picture shows. 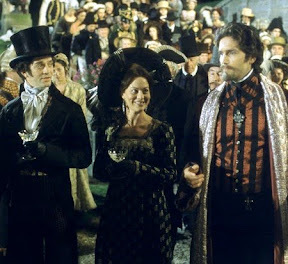 Posh production values boasting picturesque European scenic views, elaborate nineteenth century period art direction and lush character-enhancing costuming help cushion director Kevin Reynolds’s genre appropriate penchant for movie melodrama in this – Hollywood’s tenth sudsy swordfight-laden spin on Alexander Dumas’s original eponymous epic centering on the vengeful Count of Monte Cristo. Made by a company so successful at adapting classic adventure in a multitude of mediums from animating Robin Hood, developing a Syn miniseries, a Zorro series and a big screen Musketeers release that they could take out a patent or outsource an entire assembly-line like factory devoted to the craft, Touchstone’s parent company Walt Disney Studios spared no expense in bringing Dumas’s tale to the screen. Given a gorgeous Blu-ray high definition transfer that brings post-Napoleonic France directly into your living room, Robin Hood: Prince of Thieves and Tristan & Isolde director Kevin Reynolds introduces us to Jim Caviezel’s soon-to-be-betrayed lead in the form of the gentle, ethical and unfailingly loyal illiterate sailor Edmond Dantes. 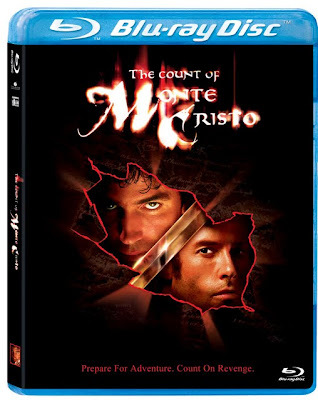 Manipulated by his spoiled, selfish – not to mention wealthy and titled – lifelong best friend Mondego (Guy Pearce), Dantes finds himself knocked down like a chess pawn in one of the games the two used to play as children. 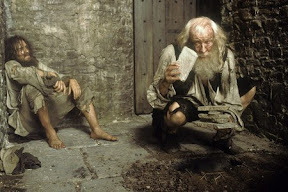 While spending more than a decade in Shawshank Redemption-like prison conditions, Dantes plots not only his escape but also his plans to embark on a new game once he reaches the outside, putting Mondego in the position of a pawn to his king (or rather the fictional “count” he reinvents himself as) in order to exact revenge. 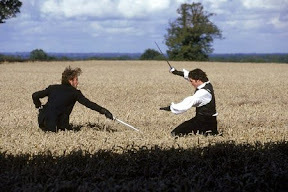 Extremely ambitious and considerably well-executed throughout, although the tenth cinematic Count consistently holds your attention at least for the entire count of each characters’ elaborate psychological and physical moves and attacks, overall Reynolds’s Count is nearly undone by its initially sluggish and ultimately staccato pacing problems. 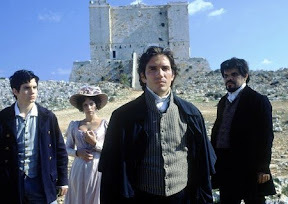 Spending far too much time locked up with Dantes while suffering from a postmodern Green Mile of the Monte Cristo Redemption-like feel before having to breathlessly rush through the ultimate comeuppance vs. Mondego which the entire crux of the character’s arc had been based on makes the final reel a bit of an unsatisfying letdown. While unfortunately the pacing issues take their toll on Count’s overall success, it’s a bit easier to overlook some laughable gaffes in the believability of the timeline given the dubious “aging” of the picture’s primary characters. 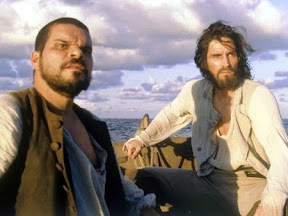 Despite the fact that neither Caviezel or Pearce appear to have changed a day since the purported sixteen year gap in time that marries the beginning of the film to its conclusion, the magnetism of the men in their performances more than makes up for the shortcomings in makeup (if not story structure). Though it’s Memento’s Guy Pearce that manages to steal focus throughout as Dumas’s diabolical villain, particularly when pitted against the rather one-dimensional development of Caviezel’s gallant yet guileless and initially dim sailor, the plight of our dogged lead and revenge by any means remains not just as cinematically compelling as ever but fascinating enough to make new fans reach for the scribe’s swashbuckling source material.